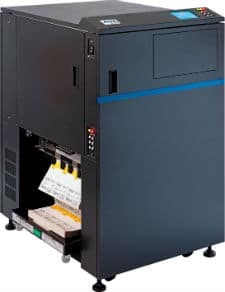 The high-speed SATO continuous form laser printer – choose the SATO LP 100R laser for fan-fold labels and transaction documents. for a fast 100 PPM continuous feed laser printer. The LP 100R provides high-speed wide-web production printing while it quickly generates high-volume labels or transaction documents. Handles a wide variety of challenging continuous form factors. on paper, vinyl and clear labels, large and small. The Sato LP 100R flash fusing laser printer is a more economical industrial laser printer than other units, using about two-thirds the cost of supplies as compared to other new printer options available. In contrast to a slightly higher printer purchase cost, the break-even economics of the operational cost of running most production volumes is much more in the favor of the Sato LP 100R laser printer. ALL the items you need, and coupled with the CF Laser Professionals at Sato Printers! Label stock is a popular media to run in the SATO LP 100R, and SATO is also a manufacturer of label media as well for the customer. The maintenance service page click charges can be waived while the Sato continuous form printer customers are buying SATO labels or other media. SATO also offers the world’s best apparel hang tag production system when the LP 100R is combined with the SATO CS-9018 cutter/stacker. The SATO LP100R laser printer and SATO CS-9018 cutter/stacker are used by large retailers requiring long print runs while in turn need to efficiently turn blank stock into finished single hang tags. The CS-9118 is of great utility, especially for high volumes of cards, handouts, religious tracts, event tickets and more. Print Speed: (max.) 100 pages per minute, 2-up Letter 8.5×11″, 65 ppm in Landscape 8.5″, as well as 50 ppm in 1-up Portrait 11″ tall Letter. Need to Replace Oce VS 6100 and Oce VS 7100 Label Production Laser Printers? Need flash fusion as an important part of your operation? Customers with Oce printers are looking for a replacement strategy since Oce announced the end-of-sales and end-of-support for the Oce Variostream VS6100 printers. In addition, Oce no longer sells and will soon withdraw support on all the Oce Variostream VS 7100 family of printers. Together with Sato’s commitment to the IPDS language, the LP 100R is a great affordable pick for the Oce customer set. Ready to Move from Ricoh InfoPrint to a Vendor that is Still Solidly in this Space ? Years ago, Ricoh / InfoPrint pulled out of the CF printer market segment of around 45 to 70 feet per minute. They discontinued the sale of the InfoPrint 75 and InfoPrint 100. They quit offering service on the InfoPrint 3000 and IBM 3900. The InfoPrint 4000 and 4100 are not for sale as new units. The Ricoh website for Continuous Feed Printers no longer show any lasers at all – only their very expensive and high volume production inkjet machines. If you are an IBM / Ricoh continuous-form customer and want to have a printer vendor dedicated to your volume and your future, and invested in your success, contact us and Choose SATO LP 100R Laser printing. Deal with a CF Laser Printer Expert – Choose GLM. Call today at 817-939-5614. SATO is offered through GLM’s authorized affiliation with Printer Connection, Inc., who is a distributor of SATO laser printer products. Many customers have inquired through our GLM website and acquired CF laser printers from GLM’s sales relationship with PCI. Deal with a CF laser printer expert.